After 20+ years riding BMWs, I just bought an '07 Scorched Yellow mint Tiger - WOW! Handles fantasticly, plenty of power and very well balanced. Quite a bit different than my last Triumph a '72 Bonnie. But you all know that. Starting to tweak it - Coocase V36 top case, Motech Tank Bag and center stand. Any other suggestions (ie windshield?) www.twistedthrottle.com seems to have it all, any other sites good for aftermarket parts? Looking forward to a great riding season. Welcome back to our exciting world! Now you understand why the right number of cylinders is 3, don't you? As for the windshield, my all time recommendation still stands firmly: Palmer product mouting kit (banner on the right of the home page). Welcome back. Oh the fun you will have changing and added (farkling) Tiger. Hi and Welcome Jeff. The Coocase 36 suits the Tiger very well, big enough without being too big. I'd wait on buying another screen for a while and weigh your options, lots of people wasted money buying screens that don't work. The Palmer kit (adjustable bracket which raises your OEM screen) is probably the safest bet at the moment. Hi Jeff and welcome to the forum. I'm quite tall and only experienced buffeting beyond 90mph or so, after that it gets quite bad for me. 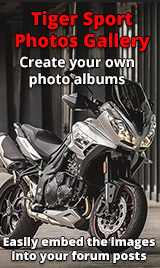 I was thinking of getting the touring screen from triumph but was advised to look at other options first. I think the palmer products are well made and could do the job, but everyone is different. I have ordered the high seat so this may have an even more adverse on my buffeting. AND I found I lost ALL buffeting when I replaced my mirrors with bar ends.